Duterte will not reveal how much Manny Villar gave him in 2016: Ang Comelec pakialamero, hindi naman niya pera! 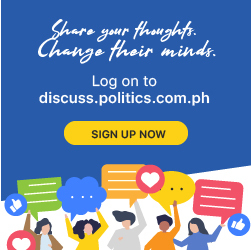 President Rodrigo Duterte said he would not reveal how much money was in the bag which bilyonaryo Manny Villar and his wife, Senator Cynthia Villar, gave him for his 2016 presidential race. Duterte said he would also not reveal if he used the money for his campaign or saved it for his own or it gave it away to other people. “Twice kami nagkita, tumatakbo ako. Kandidato na ako. Ipinatawag ako ni ma’am pati ni Speaker. At sabi nila, ‘Magtulong kami, sir. Tumakbo ka’. Twice. Nagtulong. Magkano? Ah hindi ko sabihin kasi ‘yung Comelec p***** i** pakialamero,” said Duterte in a speech in Marikina. “Hindi naman kanyang (Comelec) pera. Hindi naman mapupunta sa kanya. Bakit niyo pa pakialaman kung sa kanino mo ibinigay? Pero totoo tinulungan nila ako and kaya ako grateful talaga rin. But I said may sharing-sharing ‘yan sila,” he added. In his Statement of Contributions and Expenditures (SOCE) submitted to the Comelec, Duterte reported spending P371.5 million of the P375 million in total contributions he received for the campaign. Manny and Cynthia were not among the campaign backers Duterte declared. How much money does President Duterte have?